Heritage Builders, Sarasota’s finest luxury custom home builder demonstrates their careful eye for timeless architectural detail with this one-of-a-kind custom residence on Bird Key. Thoughtfully designed around the client’s requests this West Indies inspired residence is a masterpiece of exceptional standards and attention to detail. From concept to completion, Heritage Builder’s philosophy provides unparalleled livability and enduring value to all of their clients. Whether building a home on your home site or ours, on or off the water, the Heritage Builders team will guide you every step of the way and deliver only the best in quality materials and craftsmanship. Contact us today for details on our available homes or to start designing and building your dream home. Sarasota’s newest West of Trail gated enclave, West Bay, has only two opportunities remaining. This private gated enclave is ideally situated in Sarasota’s coveted West of Trail area and is just minutes to the areas best shopping and beaches. The four custom residences in West Bay are designed and delivered by Heritage Builders, Sarasota’s finest luxury home builder. Through the gated entrance, Owners and Guests are greeting by lush tropical landscaping lining the decorative paver driveway and four elegantly appointed Coastal and West Indies inspired residences. These open great room homes are comprised of 4 bedrooms, 3-1/2 bathrooms, study, bonus room and an expansive outdoor living area with lagoon style pool and spa. Don’t Delay, contact us today for details and showings! The Biscayne at West Bay | Sold! Heritage Builders, Sarasota’s finest luxury custom home builder is excited to announce that the Biscayne in West Bay has sold. The Biscayne embodies casual elegance behind the private gates of this enclave of just four single-family homes in the coveted West of Trail neighborhood. The Great Room, open Kitchen with stainless steel appliances and casual Dining Room overlook an enchanting courtyard pool and spa that is framed by wide sliding glass doors. The Owners' Suite is elegant and voluminous, featuring dual walk-in closets and a stunning Owners' Bathroom with free-standing bathtub. A spacious Study and en suite Guest Bedroom are both located on the first living level for convenience. The second living level with two guest bedrooms is centered on a spacious Bonus Room, where family members and guests can enjoy private lounging. A three car garage provides generous space for vehicles and storage. The Antigua II at Eastbrook | Sold!!! Heritage Builders, Sarasota’s preeminent builder of new custom homes and luxury homes is excited to announce that The Antigua II at Eastbrook Drive has sold. This elegantly appointed custom home is situated on an oversize estate home site in Sarasota’s most sought after West of Trail neighborhood. Complete with 4 Bedroom Suites, 4 and 1/2 Bathrooms, 3 Car Garage, Study, Bonus Room and sprawling outdoor living area complimented by the sparkling pool and heated spa, The Antigua II will leave you breathless. The Antigua II plan remains available to build on your home site. To learn more about our design/build services and other available West of Trail homes, please click on the link below or call (941) 328-3272 to speak with an associate. Heritage Builders was featured in the Sarasota Herald-Tribune’s Business Weekly on October 29, 2018. The article profiles Heritage’s latest new home community, Sandhill Lake, and the company’s track record of success in Sarasota’s custom home and new home community markets. Steve Brown, one of the company’s principals, is interviewed by the Herald and explains what distinguishes Heritage Builders as a custom home builder and community developer. Please join the Heritage Builders team this weekend, October 20 and 21 for Sandhill Lake’s Grand Opening Celebration. Leisurely tour our designer furnished model homes and preview our quick move-in homes. This breathtaking gated community has only 43 single-family homes; Residents’ Club with clubhouse, heated spa and pool, al fresco kitchen; fire pit and more. All residences in the community have landscaping and lawn care included, for the ultimate in low-maintenance living. Heritage Builders, Sarasota’s most reputable custom home builder, conceived and built Sandhill Lake. Please call us at 941-234-0432 for more information or stop by our models from 10am - 4pm, Monday-Sunday. Ideally located on Clark Road, approximately two miles east of I-75. Sandhill Lake is on the right going east. We hope to see you this weekend! Heritage Builders has broken ground on three stunning custom homes at West Bay, ideally located in Sarasota’s coveted West of Trail neighborhood. These luxury residences feature timeless West Indies architectural styling, finest design appointments and the high level of quality, which is a signature of Heritage Builders. As a gated community, West Bay offer a rare level of privacy in the West of Trail area. Homes at West Bay will have the most desirable interior features such as impact resistant windows and doors, ultra premium carriage style garage doors, stainless steel appliances, attractive mix of hardwood and porcelain flooring, locally made custom cabinetry with 3/4” plywood boxes, Icynene insulation, natural stone counter tops, 8’ solid core interior doors and more. On the exterior, West Bay provides dimensional composite shutters, concrete roof tiles, heated pool and spas and lush tropical landscaping. Pricing at West Bay is in the low $1 millions, with delivery starting in Spring 2019. Please inquire today to learn more about this limited opportunity. Heritage Builders is Sarasota’s finest custom home builder, building breathtaking single-family homes of the highest quality. Heritage Builders is pleased to announce that its two new designer furnished model homes at Sandhill Lake in Sarasota are now open for preview. The community development work is wrapping up in anticipation of our Grand Opening Weekend, Saturday and Sunday, October 20the and 21st. Sandhill Lake is a private, gated enclave with low-maintenance home sites, clean coastal architecture, lush tropical landscaping and Residents’ Club. For more information about Sandhill Lake or to schedule a private tour of our models and community, please visit www.SandhillLakeSarasota.com or call 941-234-0432. 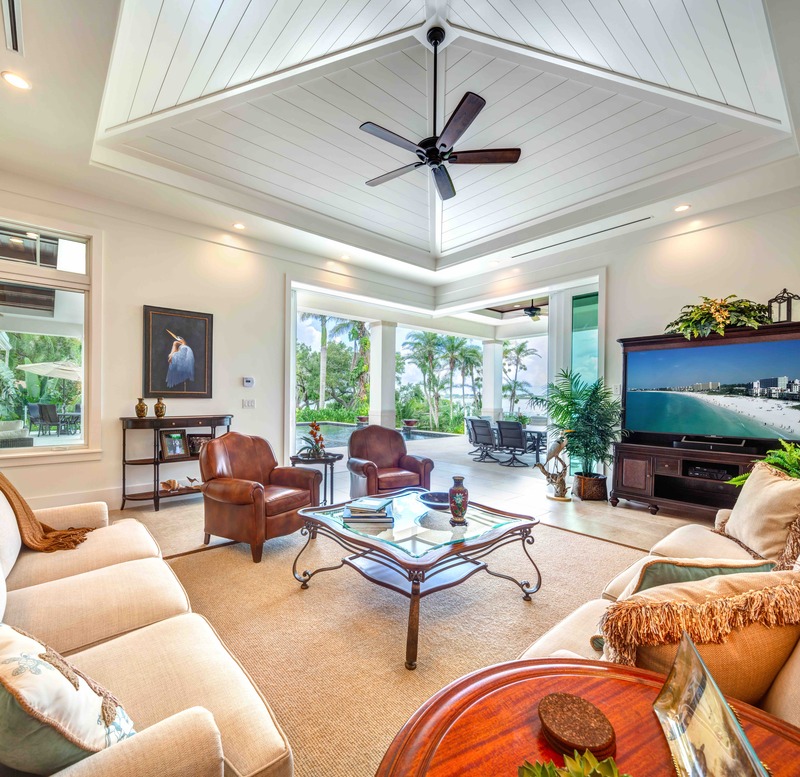 This community is brought to you by Heritage Builders, Sarasota’s finest custom home builder. Heritage Builders prides itself on delivering stunning custom homes and portfolio homes in its private communities. Heritage Builders, Sarasota's preeminent luxury custom home builder, is excited to announce the ground breaking of their newest custom home, the Sanibel at Red Rock Way. Ideally situated on a 17,000 square foot estate home site on Red Rock Way, which is located in Sarasota's most desireable West of Trail area. 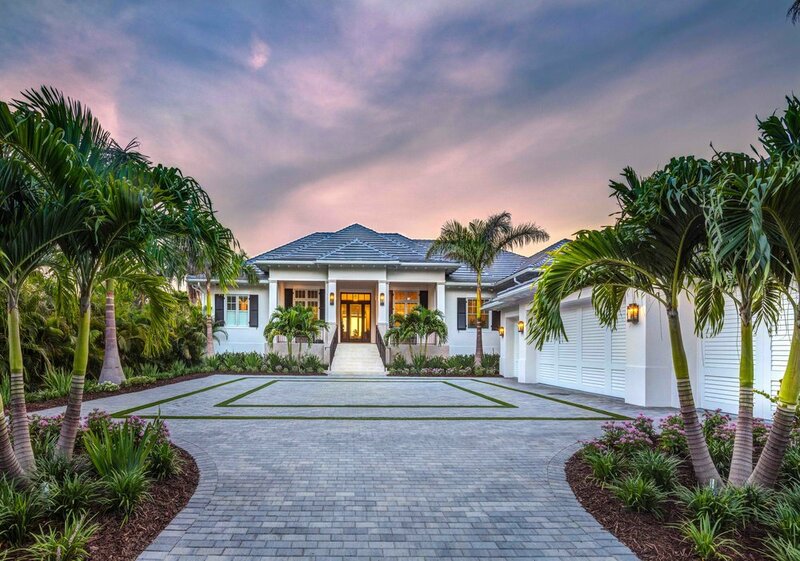 The Sanibel showcases elegant West Indies inspired architectural design, with a unique four-car courtyard garage design, including private entry into Master wing of the house. At just over 3,800 square feet, this custom residence has four bedrooms, four and a half baths, study, TV lounge and outdoor shower. Owners are greeted by tall ceilings in the Great Room with beams and ship lap inset. A striking fireplace and chef's grade kitchen bookend this open living area, while large panels of glass opening to outdoor living and elevated pool deck are the breathtaking backdrop. The Master Suite is expansive, with an opulent master bathroom with free-standing tub and private outdoor shower. Heritage Builders is Sarasota’s finest custom home builder and new home builder. Only the highest quality of construction and design will be delivered, from impact windows, icynene insulation, solid wood cabinets, quartz and granite counter tops, Thermador Appliances to concrete roof tiles. Anticipate completion for Summer 2019. For details about this and our other available custom homes, please call at (941) 328-3272 or email Info@HeritageBuildersWFL.com. Heritage Builders is Sarasota’s elite custom home builder. Heritage Builders prides itself on designing and delivering custom homes of the highest quality and enduring value. Heritage Builders is pleased to introduce their newest luxury custom home, The Cayman. 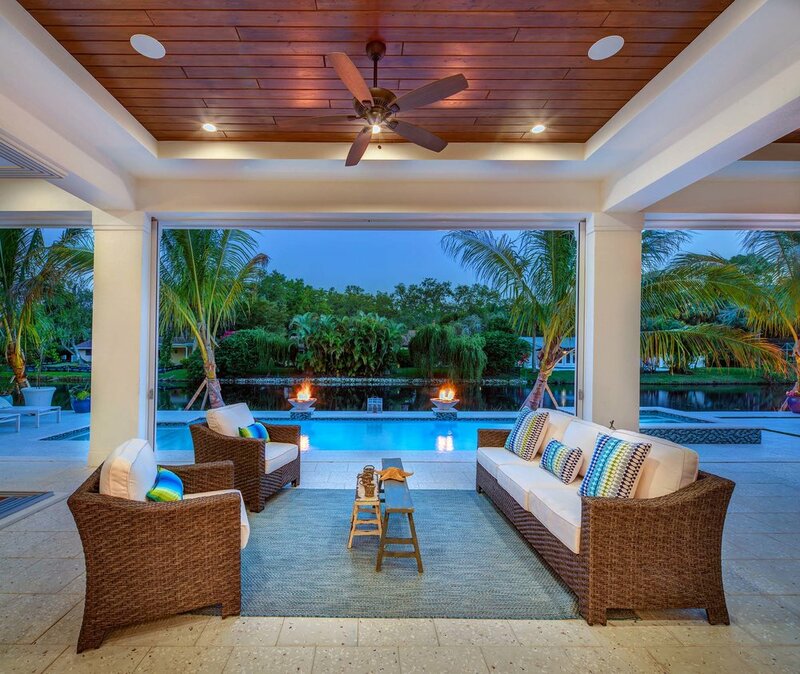 This one-of-a-kind, West Indies inspired home is located West of the Trail in Sarasota's exclusive Oyster Bay area and is situated on nearly a half acre estate home site. As you approach the Cayman through the canopy of old oak trees, you'll be greeted by an expansive circular drive with opposing two car garages and Grand Entry. The interior is a spacious and comfortable Great Room layout with Vaulted Gable ceiling fitted with custom carpentry beams, fireplace, sweeping views of the outdoor living and pool through a Wall of disappearing glass doors. The guest hall with half bath, ample closets and the Hobby/Exercise Room, is located right off the Foyer. The Study, open air Chef’s Kitchen and a 16’ x 12’ family Dining Room with access to the Outdoor Kitchen and Dining area are all encircled around the Great Room for a wonderful family or entertaining flow. The Cayman offers three Guest/Family en suite Bedrooms, a large Laundry/Utility Room, Television Lounge with access to the pool, a Master Suite with two 10’ deep walk-in closets and large Master Bath offering both step in shower, stand-alone soaking tub and separate L-shaped vanities. Only the highest quality of construction and design will be delivered, from impact windows, icynene insulation, solid wood cabinets, quartz and granite counter tops, Thermador Appliances to concrete roof tiles. Anticipate completion for Summer 2019. For details about this and our other available custom homes, please call at (941) 328-3272 or email Info@HeritageBuildersWFL.com. Custom homes by Heritage Builders are delivered to the most exacting standards. This custom home builder is renowned for its quality custom homes and private communities. Heritage Builders, Sarasota's leading custom home builder is pleased to announce the ground breaking of another luxurious new residence on Bird Key. Thoughtfully conceived by Heritage Builders and composed of everything the customer requested, this home defines the Design/Build process we offer to our Buyers. From searching for the perfect piece of property, designing the plan and finishes with the customer and building the home with unparalleled quality and attention to detail, Heritage Builders will ensure you receive an exceptional level of service. If you have interest in learning for about Heritage Builders fine custom homes or how we can design and build your custom home, please call (941) 328-3272 or email Info@HeritageBuildersWFL.com. Heritage Builders, Sarasota's preeminent luxury custom home builder, completes The Estates at Red Rock. Capturing the essence of waterfront living, The Estates a Red Rock is located just West of the Trail in Sarasota and is convenient to all the amenities Sarasota has to offer. Just minutes from the white sand beaches of Siesta Key, this unique enclave with picturesque views of Sarasota Bay was thoughtfully created by Heritage Builders with only three luxury custom homes each situated on half acre to just over one-acre home sites. Thoughtfully designed by the Heritage Builders in collaboration with the Buyers, these custom homes are a testament to the expertise and commitment of the entire Heritage Builders team. Ranging from $2 Million to $4 Million, these 3,800 to 5,500 square foot luxury custom homes are comprised of only the best in quality materials and construction practices. Whether you're building your home on a waterfront property or on a West of Trail home site, the Heritage Builders team will ensure you receive the service you deserve. Heritage Builders, Sarasota's most accomplished luxury custom home builder, is excited to announce the ground breaking of their latest custom home, the Antigua II. Ideally situated on an expansive 15,000 square foot home site on Eastbrook Drive, which is located in Sarasota's most coveted West of Trail area. This beautifully appointed home has 3,773 square feet of air conditioned living space and boasts three en suite Guest Bedrooms, a large Laundry Room, Television Lounge with access to the pool, Study, a Owners Suite with two generous walk-in closets and large Owners Bath offering both step in shower, stand-alone soaking tub and dual vanities. Through the custom built mahogany doors at the Entry, you are greeted by an expansive Great Room with a voluminous tented ceiling and disappearing wall of 10 foot tall by 16 foot wide sliding glass doors overlooking the breathtaking outdoor living space and sparkling pool and spa. Only the highest quality of construction and design will be delivered, from impact windows, icynene insulation, solid wood cabinets, quartz and granite counter tops, Chef's grade appliances to concrete roof tiles. Anticipated completion for Spring of 2019. For details about this and our other available custom homes, please call at 941-328-3272. Heritage Builders is Sarasota’s finest custom home builder and new home builder. 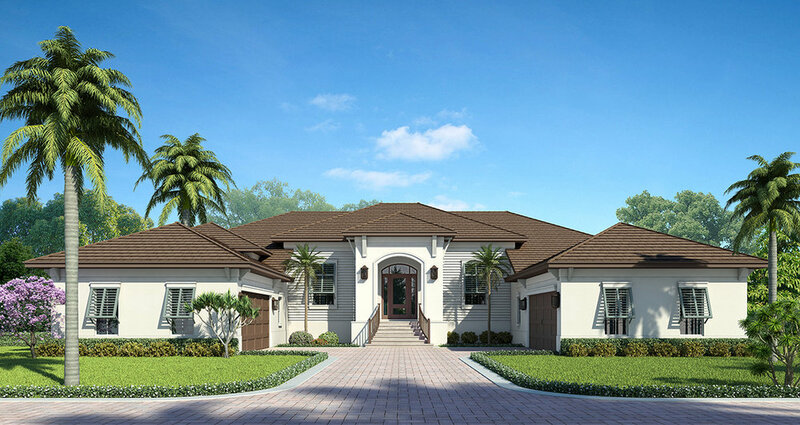 Heritage Builders is pleased to unveil its latest custom home, the Sanibel at Red Rock Way. 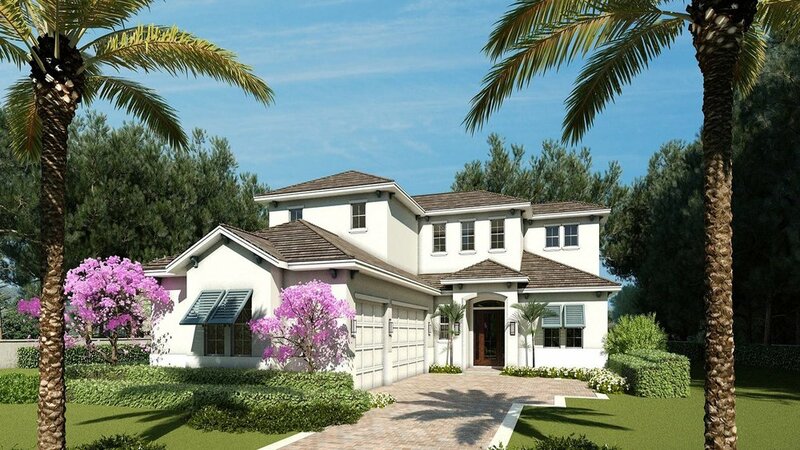 The Sanibel showcases elegant West Indies inspired architectural design, with a unique dual four-car courtyard garage design, including private entry into Master wing of the house. At just over 3,800 square feet, this custom residence has four bedrooms, four and a half baths, study, TV lounge and outdoor shower. Owners are greeted by tall ceilings in the Great Room with beams and ship lap inset. A striking fireplace and chef's grade kitchen bookend this open living area, while large panels of glass opening to outdoor living and elevated pool deck are the breathtaking backdrop. The Master Suite is expansive, with an opulent master bathroom with free-standing tub and private outdoor shower. The lot is located in one of Sarasota's most desirable West of Trail locations. Heritage Builders is a boutique custom home builder in Sarasota, building the finest homes in the area. Please call us at 941-328-3272 if you have interest in the Sanibel or building a home on your lot. The Abaco at Eastbrook repeats its impressive performance from 2017 by sweeping all awards in its category and garnering "Best Overall" in the 2018 Parade of Homes. 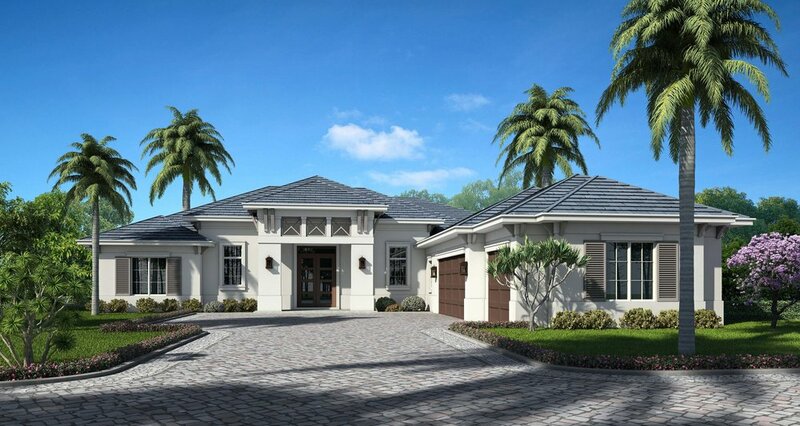 The Abaco is a stunning, West Indies-inspired custom home, located in Sarasota's desirable West of Trail area. This four bedroom, four and a half bath home features dual courtyard style garages, open Great Room living, chef's grade kitchen and a vast lakefront outdoor living area. Custom touches abound in this home, including mahogany entry door, custom trim details, home automation, Wolf/Sub-Zero appliances, high-end cabinetry and more. 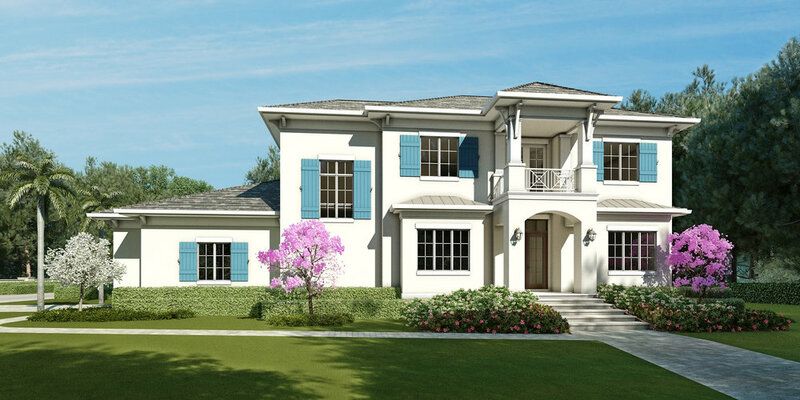 The Abaco was conceived and delivered by Sarasota's boutique custom home builder, Heritage Builders. The Abaco is open March 10 and 11 from noon til 4pm during the Parade of Homes. Private viewings can also be scheduled by calling 941-328-3272. In its inaugural entry in the 2018 Parade of Homes, The Magnolia sweeps all awards in its category and takes "Best Overall." This Coastal Florida-inspired home features crisp lines, stunning designer finishes and custom home touches, brought to you by Sarasota's finest custom home builder, Heritage Builders. The Magnolia can be reproduced, with your custom touches, at Sandhill Lake, Heritage Builders' latest new home community, centrally located in Sarasota. The Magnolia Preview Center in Heritage Builders' Ashton Oaks community is open daily 10am til 4pm for viewing. Please stop by or, for a private showing, please call 941-234-0432. The gated enclave in Sarasota's coveted West of Trail area is now available. Construction on just three elegant West Indies designs by Heritage Builders, Sarasota' premier custom home builder, is now under way. 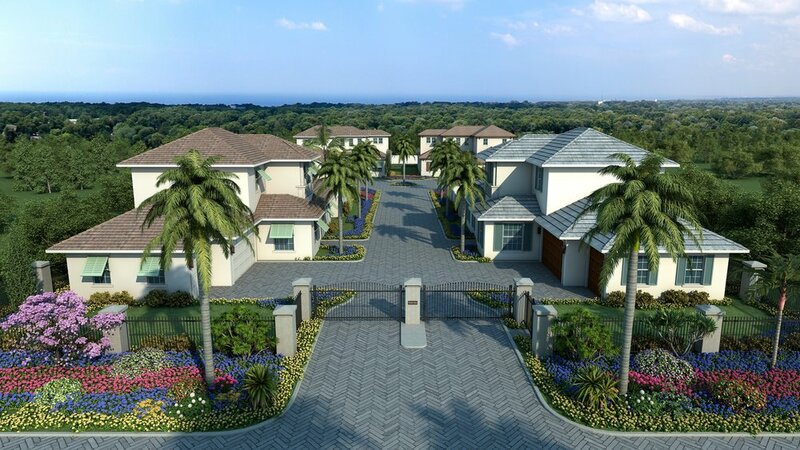 Each residence features four bedrooms, three car garages, pools and spas and lush tropical landscaping. For more information about the homes at West Bay, please click here. For more information about the residences at West Bay, please click below. Please join us Saturdays and Sundays February 17th through March 11th to view the Abaco designer furnished model home by Heritage Builders. The Abaco won "Best Overall" at the 2017 Parade of Homes with its clean West Indies-inspired design and elegant interior appointments. Heritage Builders is Sarasota's most reputable custom home builder. Heritage Builders provides new home design and construction services, and also offers a variety of portfolio custom home designs to choose or modify.